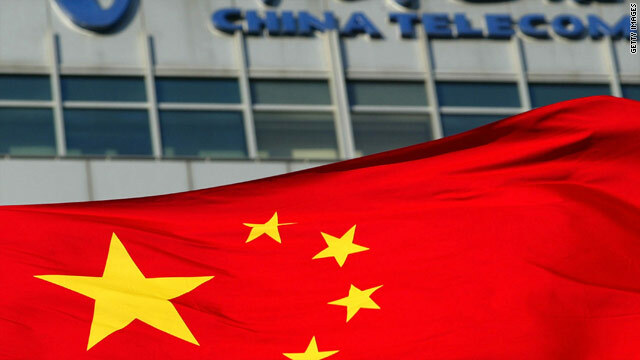 China Telecom has denied any highjacking of U.S. internet traffic. Washingtom (CNN) -- Internet traffic from several U.S. government agency sites was briefly diverted through servers in China in April, congressional investigators reported Wednesday. For 18 minutes, about 15 percent of all web traffic was redirected through China, including traffic to and from the sites of the U.S. Army, Navy, Marine Corps, Air Force, the office of the Secretary of Defense, the Senate and NASA, according to a report delivered to Congress by the U.S.-China Economic and Security Review Commission. Investigators say the web traffic was diverted by China Telecom, a state-owned enterprise. They do not know whether the diversion was intentional, whether the government of China played any role, or whether any sensitive data was compromised. The report says that the irregular routing could have allowed the surveillance of users or sites, the disruption or diversion of communications and the compromising of supposedly secure encrypted sessions. Pentagon spokeswoman Lt. Col. April Cunningham said the Defense Department "is concerned about any Internet traffic being intentionally rerouted outside of the usual operations." But, she said, "the security of Department of Defense information is not affected by misdirection of internet traffic." The Pentagon had no information to confirm whether the incident occurred, she said. The Pentagon is in the process of establishing procedures "to address any potential current and future vulnerability," Cunningham told CNN. Larry Wortzel, a member of the commission, said that given access to a stream of military traffic for 18 minutes, it might be possible "with really good computers" to get "a little information." But another risk, he said, was that it could create an opening for spyware infiltration. "If you were a pretty knowledgeable intelligence service, you would get the internet addresses of everybody that communicated. And then you could essentially engineer a fake e-mail," he said, "and if someone opened an attachment, you would then insert a virus into the whole system." The report alleges that the diversion was caused when China Telecom briefly offered a false electronic notification to internet traffic on the web, causing some traffic to mistakenly conclude that the quickest way to reach its destination was to travel through the company's servers in China. A spokesman for the Chinese embassy in Washington rejected the claim. "The commission's specious and unwarranted allegations against China and its enterprises are irresponsible," said Wang Baodong. "China will never do anything to harm other countries' national security, either in real or virtual worlds." He also pointed out that China Telecom, in a statement to Reuters, has denied any hijacking of internet traffic.